Plot: Four psychics connected to the search for Andre Toulon’s secret of immortality are summoned to an old hotel, where they are attacked by killer puppets. It may seem like an odd way to lead to puppets massacring people in a hotel, but it works! Killer: An army of living puppets. No surprise there, although their reasoning behind killing is a decent mystery to keep the film going. Critique: Some of the best themes in horror take something heart-warming and fun in real life and make it sadistic in murderous. That theme is what gives killer toys and puppets such potential in horror movies. You don’t expect something from your childhood to try and kill you. At least, I didn’t expect my G.I. Joe figures to come to life and try to gun me down. Well, maybe Destro, but that’s a given. 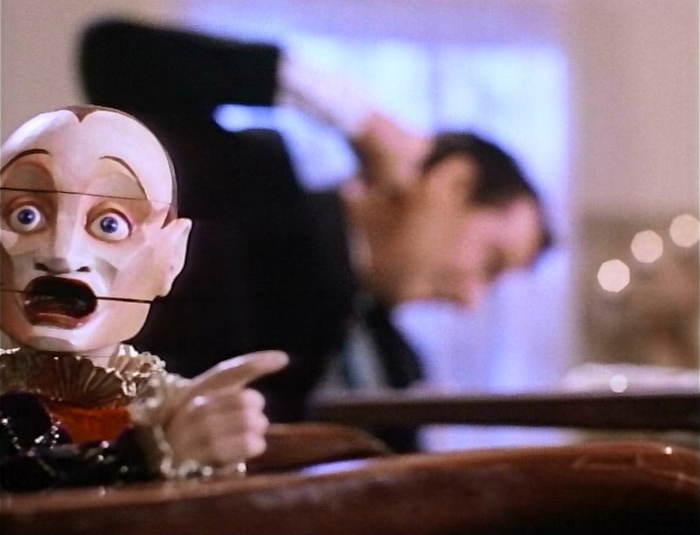 Puppet Master wasn’t the first horror film to take on this “cute turned killer” theme. Child’s Play was released just before it, Dolls before that, and films like Trilogy of Terror, Black Devil Doll from Hell, Magic, Attack of the Puppet People, and Devil Doll before even those earlier, popular films. 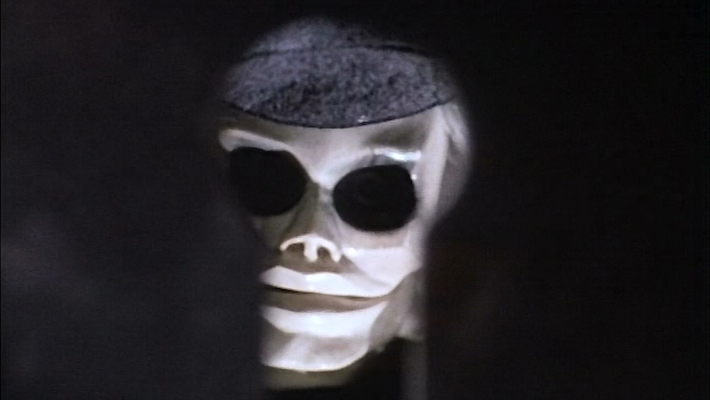 But Puppet Master has its own identity due to storytelling and, most importantly, how fluid the puppetry melds into the cinematography, which felt ahead of its time. The puppets don’t suffer from the jerkiness of animatronics or out of place green-screen production that low-budget horror usually has. The puppets feel real. This realistic approach is helped by what the puppets do, even in the most seemingly insignificant act: Pinhead punching at the air; Blade dragging around a chair so he can spy on the psychics through the keyholes of their doors; Blade wiping amputated fingers off of the top of an elevator; Jester pointing with a frowny face. Add that to the sense of self that the puppets have along with the hint of a moral compass, and you have a gang of killers made up of inanimate figures that you end up feeling a slight tinge of sympathy for. 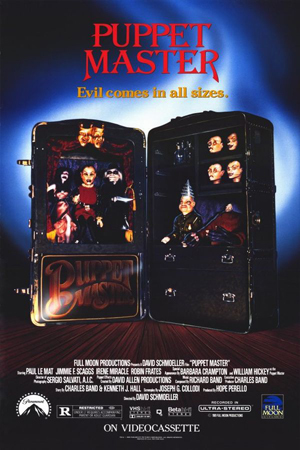 Unfortunately, this caring doesn’t really transfer to the human characters in Puppet Master, save maybe Alex (Paul Le Mat) and Megan (Robin Frates) to a small degree, but this movie really isn’t about them. It’s about the puppets, and they are what made this film into a franchise. Scene of Awesomeness: The puppets turn on their master after Jester is tossed around, and gives the rest of the puppets a frowny face. 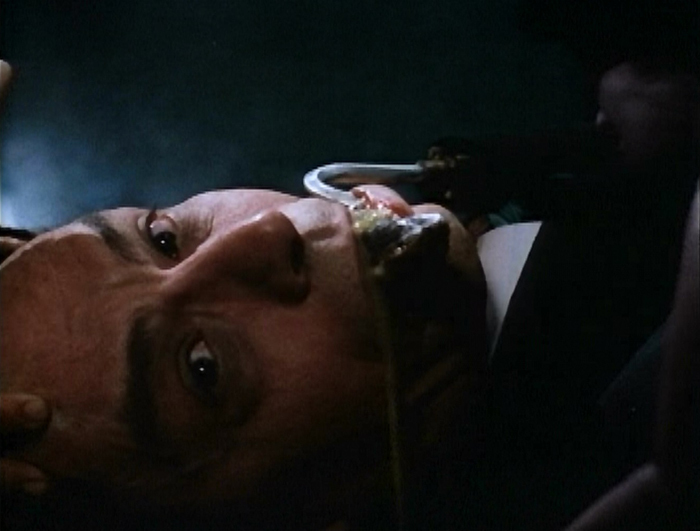 It’s the cutest moment in the film that leads into the most graphic moment, and the contrast is awesome. Scene of Ridiculousness: Any scene where we follow Blade’s POV running around, huffing and puffing. It’s ridiculously goofy, but gives us the idea that the puppets are like miniature people, with miniature lungs. 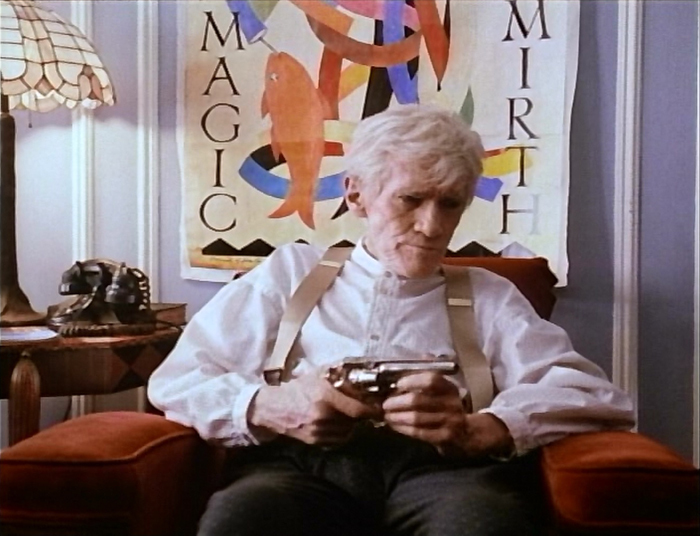 Actors/Actresses of Note: William Hickey is the big name in this cast, turning in some short screen time as Andre Toulon. Other than that, we have Irene Miracle from Dario Argento’s Inferno, Paul Le Mat from American Grafitti, and a cameo of Barbara Crampton.